* $888 ticket comes with a free [Blind Film] CD which can be redeemed at venue and autographed by Yiruma in person after the concert. 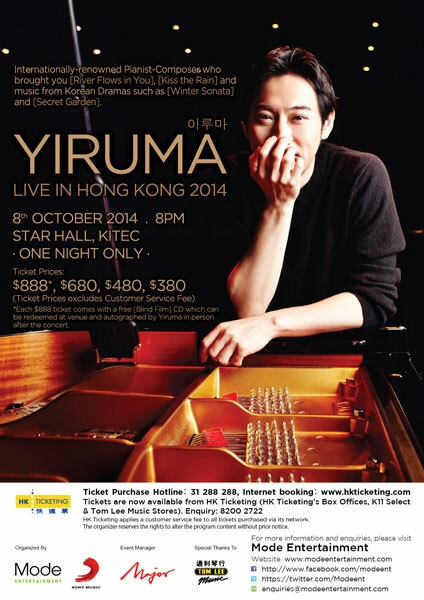 MODE ENTERTAINMENT proudly announces the widely-anticipated arrival of YIRUMA in Hong Kong. A ONE NIGHT ONLY concert, the internationally-renowned pianist-composer from South Korea will be performing at Star Hall, KITEC in Hong Kong. Says Yiruma of his forthcoming concert in Hong Kong, “I am very grateful that I will be performing in Hong Kong for the first time. I have heard that many fans there are already enjoying my music. Hopefully, my live performance would make you feel much more lyrical and emotional”. Yiruma is the stage name of Lee Ru-ma, an internationally-known pianist and composer from South Korea. Yiruma frequently performs at sold-out concerts across Asia, Europe and North America. His alma mater, King's College London, England helped him gain European popularity and recognition. Among his most popular pieces are "River Flows in You", "Kiss the Rain" and "May Be". Yiruma is considered to be a big influence to many K-pop artists. The most recent collaboration was with Super Junior M’s member Henry, where they teamed up for a new version of Yiruma’s famous tune "River Flows in You".